With this article, I’m pleased to introduce a new segment to Replicant Ears Magazine. The goal with ‘Off the Record’ is to shine the spotlight on music in other media. Film, television, literature… In other words, music-related things that don’t otherwise fit into any of our other categories. This time round, I’m spotlighting a brand new book on Flyleaf, one of my favourite bands of all time. 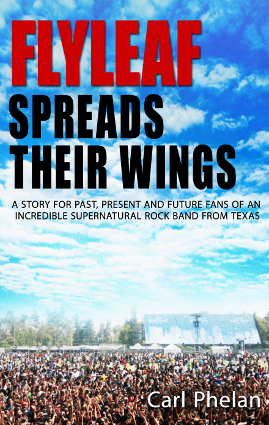 Written by Carl Phelan, grandfather of Flyleaf guitarist Jared Hartmann, Flyleaf Spreads Their Wings features a journey through the band’s history from 2002 to present. From when they were called Listen and then Passerby, to when vocalist Lacey Sturm decided to retire and Kristen May of Vedera was brought in to replace her. Most of the book is a one year per chapter account, while the rest is a very comprehensive list of all of the band’s tour dates and stories from both the band members, the families of the band members, and longtime fans of the band. There is also a brief photographic history of the time covered by the book. Dearest readers, I have been a fan of Flyleaf since early on in 2006, when I asked a co-worker to show me something like Breaking Benjamin. He met the challenge so well it began a years long love for the band. I can still remember parking my car as close to Lake Ontario as I could during night shifts so I could catch the band on New York’s 103.3 The Edge (the band had not yet broken into the Canadian market). Eventually, I had to special order the record. When I heard that someone as close to Flyleaf as the guitarist’s grandfather had written a book on the band, I grew very excited and dove headlong into the thing as soon as I got it. My official take on the book? It’s a neat, not unenjoyable read for a very big fan, but it’s definitely not what I expected. Allow me to elaborate. My first and foremost gripe with Flyleaf Spreads Their Wings is that it was not written by a ‘writer.’ It’s great that someone very close to Flyleaf, who has a genuine love for them and a tremendous understanding of what they are all about, has chosen to author the book, but it becomes apparent early on that Mr. Phelan is a proud grandfather (for good reason) first and a storyteller second. While the book does take the reader step by step through the band’s early history (the early bits are definitely the more detailed, which is great because a lot of us already know the more recent history), I was expecting the account to be much more candid. There aren’t a lot of facts I didn’t already know about going in, and there’s surprisingly little about the upbringings of the individual members. What I did love about the book are the brief glimpses into the struggle the band had to endure in getting where they are. This band worked hard. I’m amazed at the work ethic that drove them into such ruthless touring and recording schedules. The book also features photos from early on in the band’s career that I had not seen before. It’s really neat to see Lacey’s powerful stage presence alive even back then. Still, being the author had access to many old photographs, it would have been fascinating to see some pictures of the band members as children and during some of their key moments growing up. The highlight for me, in Flyleaf Spreads Their Wings, are the stories told by family and friends of the band, which Carl Phelan has compiled for us. Perhaps the most touching for me were the stories told by Kat Hartmann (Jared Hartmann’s wife), Lori Mosely (Lacey Sturm’s mother), and some of the bits on the late Rich Caldwell, who had been the band’s sound engineer since the beginning before he passed away in a tragic accident a couple of years ago. There are also clippings from old reviews and interviews that act as a mean time capsule, capturing the hopes, dreams, and opinions of the band members during pivotal moments in their careers. Do I think Flyleaf Spreads Their Wings is worth the read for Flyleaf fans? Absolutely. While you won’t find anything groundbreaking, it is quite cool to be able to look back through the stories, pictures, and tour dates and trace the path of such a wonderfully talented and inspirational band. It’s a light read, similar to leafing through your average magazine, but there are some great points of view to landmark Flyleaf moments that should not be missed by fans. Thanks Carl, you’re very welcome. The book has shed some light on a few things that I was curious to know and I’m glad I read it. Thanks for passing it on! P.S. I would sure like for you to write a review and post it on Amazon.com, thanks. Thanks so much for the follow-up notes! I’m glad you’ve taken such an active role behind the scenes. A lot of times stuff like this gets left behind and eventually lost! While I’m afraid it gets a little critical in places, I have enjoyed the album a great deal. Your book actually helped me appreciate the record more than I think I would have had I not read it. You’re more than welcome, Carl, when I get a chance I’ll head over to Amazon and put something up! 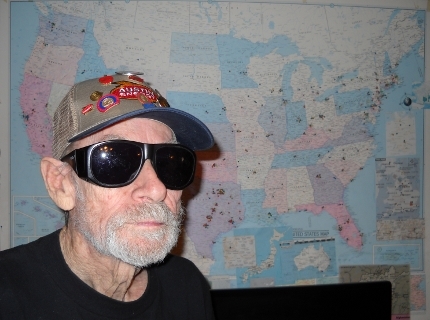 Thanks, Ryan you are a real gem a genuine light in a dark space, Respectfully, Carl P.
Ryan, I was going through some of my Flyleaf Reviews and I came across a review by Ryan Smith about Flyleaf’s CD, ‘Who We Are’ in December of 2013. It was another outstanding piece of journalism. The next time I get to talk to Jared and the band I will ask them if they have read your reviews. Thanks for all you do, later Carl.